MONTPELIER, Vt. – Hikers and rock climbers can return to Vermont cliffs starting August 1 now that peregrine falcon nesting season has ended. 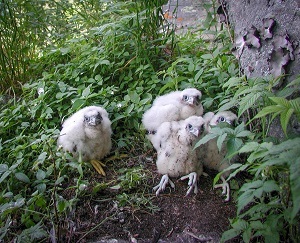 The Vermont Fish & Wildlife Department has confirmed that all the young falcons have learned to fly and will not be disturbed by human presence on the cliffs. WILMINGTON, Vt. – From climate change to parasites to the state’s changing forested landscape, moose face a variety of challenges. Scott Darling, wildlife biologist with Vermont Fish & Wildlife Department, will give a talk on Vermont’s moose population entitled Moose in Vermont – The Tiny Threats to Our Biggest Mammals on Wednesday, August 15 in Wilmington. 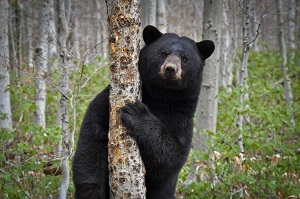 MIDDLEBURY, Vt. – Vermonters of all ages are invited to attend a presentation about Vermont’s black bears at the Middlebury Town Offices on Wednesday, August 1 at 6:00 p.m.
Vermont Fish & Wildlife bear biologist Forrest Hammond will talk about the extraordinary life history of bears, their ecology and behaviors, and what people can do to better co-exist with bears. Through colorful photos and captivating stories, the audience will come away with a new appreciation for these intelligent animals. Vermont State Game Warden Dale Whitlock will be in attendance to meet with the public and answer questions. Warden Whitlock is stationed in the Middlebury area and has extensive experience providing advice and assistance to residents on bear-human conflicts. ADDISON, Vt. – The Vermont Fish & Wildlife Department will host an evening of art in nature at the Dead Creek Visitor Center in Addison, Vermont on Thursday, August 9 from 5:30 to 7:30 p.m. This free event will consist of a short talk and refreshments at the Visitor Center, after which the group will venture outside to the wildlife management area for some nature exploration through art creation. The evening will be led by Vermont Fish & Wildlife naturalist and artist Ariel Burgess. Burgess is an ecological artist who works in art, conservation and education. She helped develop the new Dead Creek Visitor Center including designing and painting its murals. Burgess will talk about benefits of artistic observation, ecological art and help guide the group in an evening of plein air art, art created outside, on the beautiful Dead Creek Wildlife Management Area. 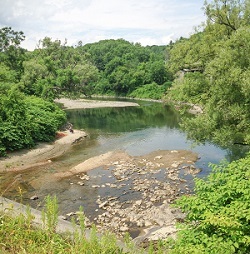 MONTPELIER, Vt –The Vermont Fish & Wildlife Department and the Vermont Council of Trout Unlimited are encouraging anglers to consider their impact on trout when fishing during the current hot, dry weather. Many of the trout streams and rivers throughout Vermont are currently at or above stressful temperatures for trout and flows in most rivers are already dangerously low. ESSEX JUNCTION, Vt. -- Applications are available for controlled waterfowl hunting permits to be used at two Vermont Fish & Wildlife Department wildlife management areas. The applications may be downloaded from Fish & Wildlife’s website (www.vtfishandwildlife), and printed applications are available at Vermont Fish & Wildlife offices in Montpelier, Essex Junction, Addison, Barre, St. Johnsbury, Springfield, and Rutland. Hunting under controlled conditions for ducks at Mud Creek in Alburgh and geese at Dead Creek in Addison has been popular since the early 1970's. Applications must be filled out correctly and postmarked no later than August 20. There is no fee to apply. A public drawing to award hunting permits will be held Friday, August 24 at 12:00 Noon at Dead Creek Wildlife Management Area headquarters off Route 17 in Addison. Attendance is not required. Successful applicants will be notified by mail and must pay a $10 permit fee on the day of the hunt. 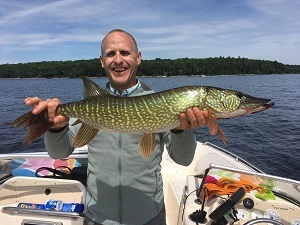 MONTPELIER, Vt – Governor Phil Scott has appointed three new members to represent Addison, Essex, and Grand Isle counties on the Vermont Fish & Wildlife Board. The new members are Wendy Butler from Addison County, Mike Kolsun from Essex County, and Bryan McCarthy from Grand Isle County. as with trash bins, bird feeders, and pet food – if not properly managed. Fortunately, Vermonters can minimize conflicts over compost by taking a few extra steps, according to Forrest Hammond, bear project leader with Vermont Fish & Wildlife. ·Most importantly, keep scent to a minimum by covering all food scraps or ‘green’ materials with carbon-rich ‘brown’ materials like dry leaves, straw, or ripped up paper. ·Turn your compost often to aid decomposition. The hunt will be restricted to bull moose in Wildlife Management Units E1 and E2 in the northeastern corner of the state where the Fish & Wildlife Department recommends the moose population be maintained at its current level to reduce the effects of winter ticks.The department expects only nine to ten moose to be taken. The small number of bulls-only permits is not expected to have any impact on Vermont’s moose population. MONTPELIER, Vt. – The Vermont Fish & Wildlife Department has announced the 2018-2019 migratory bird hunting season dates and bag limits. A printable copy of the Migratory Bird Syllabus can be downloaded from the Vermont Fish & Wildlife website (www.vtfishandwildlife.com) under “Hunt” – “Hunting Regulations and Seasons.” A printed version also will be available from license agents and post offices by late August. 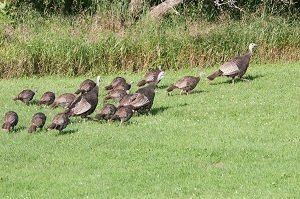 A statewide Vermont open hunting season for resident Canada geese will occur September 1-25. The daily bag limit is five Canada geese in the Connecticut River Zone and eight in the rest of the state during this September season. The purpose of the September season is to help control Vermont’s resident Canada goose population prior to the arrival of Canada geese migrating south from Canada.